Miss Martha Talks' Blog | A Blog About Travel, Reading, Recipes, and My Other Favourite Things! Hi everyone! I was visiting beautiful Seattle this past weekend and they were experiencing their first snow of the season and it was quite the experience! Like most cities that don’t often experience snow, they are generally unprepared for such weather and with all of those steep hills I don’t even want to think about all the accidents that occurred! The grocery stores were sold out of almost everything almost as if a natural disaster was about to hit. I guess it was in a way?! The snow really was beautiful though, quite the sight to behold. I never see snow down in my parts so I always relish the experience, though it made flying a bit of a challenge! I was visiting a friend and we had the best time making a snowman, drinking hot cocoa and catching up on some much needed girl talk. No matter how old you are it’s fun to play and be like a kid! I think we all crave these sorts of connections so when you find a great friend you can be yourself with it really is special. I left my pup at home being looked after by a friend and I must say I missed Keiko so much more than I expected. I rarely go anywhere without her but I didn’t think it was fair to bring her with my on the plane knowing there was a high likelihood of snow and Keiko does not like planes or cold haha! Anyways it really was a fabulous and restorative weekend and I can’t wait to do something like that again! Hello all of you beautiful people! Hope everyone is having an amazing summer and enjoying some sunshine and relaxation! Summer is such a beautiful time of year and I always wants to enjoy as much as possible. Sometimes it can even be too hot, but luckily in San Francisco our weather is pretty mild during the summer months compared to southern California. I even have to wear a sweater some days in the middle of summer here! But when I go to LA for a weekend I am practically melting! What a change! This summer Keiko and I have been exploring new parts of our city and enjoying many beautiful parks and dog-friendly cafes. This city is great for dogs and I must say Keiko really loves it. She has a few furry friends at our neighborhood dog park and it’s so cute to watch them play. I really believe dogs are good for the soul and I know Keiko brings so much joy to my life that cannot be replaced. Another favorite summer activity for us has been exploring new cafes in the city, most of which don’t mind if you bring your pup in with you while you order or on a leash on the patio. I usually set up a little water bowl for Keiko while I enjoy my iced latte and read the newspaper or a favorite magazine. Having your pup doze at your feet while relaxing=my type of heaven. My summer adventures usually involve more travel but it’s been a lot of fun to be a “tourist” in my own city this summer and discover some new places that have quiikcly become old favorites. I highly recommend a staycation in your own city! Hello everyone! Easter is rapidly approaching and I’m planning out my holiday menu for a dinner I am hosting for friends and family. IF you have been following me for awhile you might know I am following the autoimmune protocol which means I eat every clean and healthy and that can be tough over the holidays, especially if you’re not in control of the menu as we so often aren’t when celebrating with friends and family. My solution to this is to be the host so I have control over most items and let guests bring dishes too for everyone else to enjoy. I try to make four dishes: one meat, two vegetable sides, and one dessert that are all AIP compliant. That way I can enjoy healthy nourishing food and know all of the ingredients are safe without asking a million questions of the host. This is what works for me but I encourage you to explore what works for you! I signed up to the mailing listing for autoimmune wellness and they sent me a free Easter e-cookbook which is where I’m getting my recipes from for my dinner. Out of respect of their wishes I won’t repost any of the recipes here, but I am planning to make roasted leg of lamb, mashed parsnips, and an arugula salad. Don’t those sounds great! For dessert I’ll be making a lemon coconut cake. I’m super excited to try these recipes and create new healthy food traditions around the holidays! What are you cooking for Easter dinner this weekend? Hello everyone! I am still eating a very clean diet called the autoimmune paleo diet to help heal my hashimoto’s thyroidis. Generally I have been loving the diet because I feel so much better. The only hard part is eating out or at other’s homes and the holidays are so full of celebrations and traditional foods that are not AIP compliant. The way I am countering this is by hosting Christmas dinner at my house with a completely AIP menu and for dinner at others, I always let them know about my restrictions and bring a couple of compliant dishes myself in case there is nothing else I can have. I have found family and friends are usually very accommodating and understanding and although I certainly don’t expect them to create all dishes around my diet, they are usually more than happy to make sure at least a couple dishes will work for me. I have been reintroducing some foods although I have to admit I feel best on strict AIP, but with chocolate and white rice. A few other things I’ve tried give various reactions such as a stuffed nose, sore throat, constipation, upset stomach, etc. I was at a holiday party at a restaurant recently and did tell them about my restrictions which they were very accommodating about for the main courses. However I had some appetizers including some tapanade, pate, and capers that I didn’t ask about. I felt fine during the meal but once I got home after a long cab ride I felt sick and knew I must have ate something that was contaminated. I didn’t sleep well and had to wake up a couple times during the night to use the restroom. The next morning I felt congested and used the bathroom a few more times. That was a good lesson that a strict diet is necessary for me and I should never eat anything without checking the ingredients first. It feels burdensome to always be asking about ingredients but I have to put myself and my health first. For Christmas, I have complied a number of recipes I have found online to make a delicious and nutritious AIP feast. I will be making a turkey, roasted ham, brussel sprouts, baked sweet potato mash, riced parsnips, cranberry sauce, and gravy. Truly all of the traditional staples you would expect but with no nasty ingredients. Some people might miss potato but I think the parsnips will trick then. I haven’t decided what to do for dessert yet but I think I will look for a pumpkin pie recipe or maybe even attempt a coconut ice cream. I am actually looking forward to cooking all of these these delicious foods and seeing what my family thinks! I know some think my diet is too intense but I hope to show them how easy it can be! Hello everyone! I am having the most lovely summer in this amazing city enjoying many walks with my dog Keiko. I’ve recently discovered that I needed to cut back on running and other high intensity cardio and training while I heal my thyroid and Hashimoto’s. I’ve always been a bit of a gym rat, but I’ve felt so exhausted in recent months I just haven’t had the energy for the gym. Instead I starting talking longer walks with Keiko and noticed I felt noticeably better. I’m no longer dragging myself out of bed – in fact I really look forward to my morning walks before work! I generally try to walk for about 40-60 minutes everyday after breakfast. Walking after a meal helps with digestion and the morning sunlight helps regulate circadian rhythms. Keiko keeps me going at a good pace so I know I’m still getting a workout, even if its not the sweat drenched workout I once enjoyed! I’ve learned self care is so important to my health journey and that includes noticing when a previous healthy habit no longer serves you. Once I am better to I hope to incorporate some more high intensity cardio into my day, but even then I don’t think I’ll ever push myself as hard as I once did. It’s so important to listen to your body and recognize when you’ve reached your edge. Before I was constantly pushing myself to do better but now I am feeling more content with already being enough. I’ll keep you all posted on my exercise regime as I start feeling better! I’m hoping to incorporate yoga and weights next! I must apologize for my absence of the past couple of months. I have been so focused on my health after my recent diagnosis that I haven’t had the time or energy to blog as much I would like to. But I’m back to share a new recipe I have been enjoying as I test out a new diet that will hopefully help manage the symptoms of my autoimmune disease. There are so many amazing online resources and recipes for the autoimmune protocol – I encourage you to do a simple search for AIP in Google and you will see what I mean! Below is a favorite recipe from the Paleo Mom I’ve had on repeat the last few months. It’s nutrient dense AND satisfying which are not always synonymous! It almost reminds me of a traditional risotto I used to make many years ago but this version is much healthier for me. Give it a try and let me know what you think! To rice parsnips: Peel parsnips and chop into big chunks. Place in a food processor and pulse until pieces are fairly uniform in size and about the size of a large grain of rice. Two pounds of parsnips (about 5-6 medium parsnips) should yield 6-7 cups once riced. Heat a large skillet over medium-high heat. Add olive oil, onion and carrot. Saute until veggies are tender, about 5 minutes. Add ground beef to skillet and cook, stirring to break up the beef, until browned, about 3-5 minutes. Add mushrooms, 1 cup of broth, wine (or vinegar) and salt. Increase heat to high and cook until the liquid is mostly evaporated, 5-8 minutes. Add parsnips and remaining 1 cup of broth to pan and stir just to mix. Reduce heat to medium-low, and cover. Cook 8-10 minutes until parsnips are tender and mushy, stirring once or twice during that cooking time. If veggies start to stick because the pan is running dry, add another few tablespoons of broth or water to the pan. If you’re largest skillet isn’t big enough for all of these ingredients, you can remove the beef mixture before adding the parsnips and then mix the beef mixture back in right before serving. Add coconut milk and tarragon and stir to incorporate. Turn off the heat and let sit on the stovetop covered for 2-3 minutes more. Taste and add additional salt, if needed. Garnish with chopped parsley if desired. Serve! I was recently diagnosed with Hashimoto’s Thyroiditis which is an autoimmune condition where your thyroid attacks your immune system. The thyroid is small butterfly shaped gland at the base of your neck below your Adam’s apple. This disease often leads to an underactive thyroid in most patients (myself included) which is known as hypothyroidism. I received all of this news quite unexpectedly at the doctor recently. I had been feeling very tired lately and was experiencing some hormonal irregularities but I had no idea what the culprit was. My naturopath ran a million tests and this was the diagnosis. I have to admit, the information was overwhelming. I have a friend with hypothyroidism who is treating it with a prescription so I knew a little about it, but I had never heard of Hashimoto’s Thyroiditis. In terms of treating Hashimoto’s Thyroiditis, most doctors would be inclined to prescribe you a pill and let you go. I would prefer to get to the root of the cause (my naturopath would too) so she suggested some lifestyle changes to manage the autoimmune disease. She recommended removing gluten from my diet as gluten has a very similar molecular structure as the thyroid gland. Your body then begins to attack both and totally exasperates the problem. It has been hard eliminating gluten from my diet as I’ve never noticed a sensitivity to it and consume it often, but I am working on completely eliminating it from my diet. Being a holistic nutritionist I treat many clients with a gluten intolerance but it has been so interesting to be the patient! After doing more research on my own, I came across what is called the Autoimmune Protocol (AIP) which is diet for autoimmune disease sufferers such as myself. The idea behind this diet is to heal your body and gut through food alone. I am a huge advocate for good nutrition and consider myself to eat very healthy (it is my job after all, lol! ), but this diet and the book “The Autoimmune Wellness Handbook: A DIY Guide to Living Well with Chronic Illness” opened my eyes to the types of foods that, while “healthy”, might actually be worsening my condition. This book does a great job at walking a person through the initial diagnosis, the importance of being your own heath advocate, lifestyle changes to support your health, and delicious AIP recipes to nourish the body. I’ve only read the first 20 pages of the book but I love the message. I’ve been relying on my naturopath for a lot of information interspersed with my own online research and some of my holistic knowledge, but I now feel empowered to learn everything I can to make the most informed decisions for my health. The diet itself can be a bit restrictive as I can’t eat any grains, dairy, nuts, seeds, and nightshades, but I am learning to embrace this new diet if it helps me feel my best. I’ve just started on this journey but I will be posting more in the future in hopes of helping anyone else suffering with this disease! If using harder dates, roughly chop, cover with almond milk and let sit 20-30 minutes before blending. 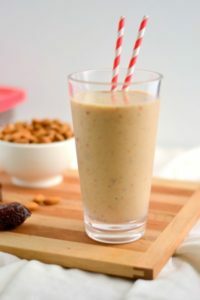 Place all ingredients in a blender and blend until as smooth as possible (there will still be some small date pieces left). Excellent Natural Sunscreen – Cut Out the Toxins! I just picked up some great natural sunscreen that works like a charm and has none of the nasty attributes of ordinary sun screen! One of my girlfriends recently told me about the risks of ordinary sunscreen and suggested that I start using natural sunscreen. Well, I conducted some research and was surprised to learn that most sunscreens are toxic and can promote the creation of free radicals in the body. Incredibly, many recent reports show that sunscreens can actually raise skin cancer risk. That’s the case even with natural, commercially available sunscreens! So, all the more reason to be careful about what you’re buying. In general, I try to avoid using sunscreen where it is possible to do so. For example, if I know I won’t be outside for very long, it’s easy enough to use a hat or shirt to shield my skin. I have always been a bit sceptical about excessive sunscreen use, especially considering that many people are vitamin D deficient, which has been linked to many other health problems. Accordingly, my approach to sun exposure is to be sure I get adequate daily exposure, without going overboard and creating a nasty sunburn that might have health consequences. If I know I’m going to stay outdoors in the sun for lengthy period of time and that a hat and shirt will not be sufficient protection, then I will consider using a natural sunscreen. There are various interesting natural sunscreen recipes available online. However, for those of us who don’t have the time and inclination to make our own since there are some decent options available for purchase. The brand that I am quite fond of is called Badger Organic. You can learn more about it here. Enjoy the sun and remember to stay safe!